If you are looking for a truck that will work as hard as you do, a closer look at the RAM Chassis Cab is in order. RAM has offered its chassis cab-style truck for more than a decade and has been impressing drivers with its incredible power and functionality throughout that time. The 2019 Chassis Cab may be a work truck, but it also is loaded with all of the tech and comfort features that you need when you spend long hours on the road each day. Our dealership serving Albuquerque Los Lunas Santa Fe is the place to go to learn more about the Chassis Cab's features and capabilities. The 2019 RAM Chassis Cab in Albuquerque has the stunning front-end design that you may already be familiar with from other RAM trucks. Features vary based on trim, but you can expect all of the Chassis Cab trucks for 2019 to have four doors for easy entry as well as a distinctive grille with RAM lettering blazoned across it. The actual grille design varies by trim level, but the grille on all trims fades into bold LED headlights and blends upward into a muscular hood. The black trailering sideview mirrors protrude outward substantially to ensure visibility when your truck is retrofitted for your work activities. The rear has dually tires and can be upfitted to your specifications. In fact, its steel frame has an impressive strength of 50,000 PSI. The dual alternator can put out up to 440 amps as well for superior functionality. Our RAM sales associates serving Albuquerque Los Lunas Santa Fe understand how important it is for your new work truck to live up to your highest expectations and to meet or exceed all of your needs, and we are thrilled to answer your questions and help you to pick out a truck that is right for your work activities. When you check out the 2019 RAM Chassis Cab in Albuquerque, the four available trims will immediately jump out at you. These trims are the Laramie, the Limited, the Tradesman and the SLT. These are all spacious trims that provide seating for up to six passengers depending on the seating configuration selected. Interior features vary dramatical depending on the trim that you select, but all are decked out with a full range of functional and comfort features. 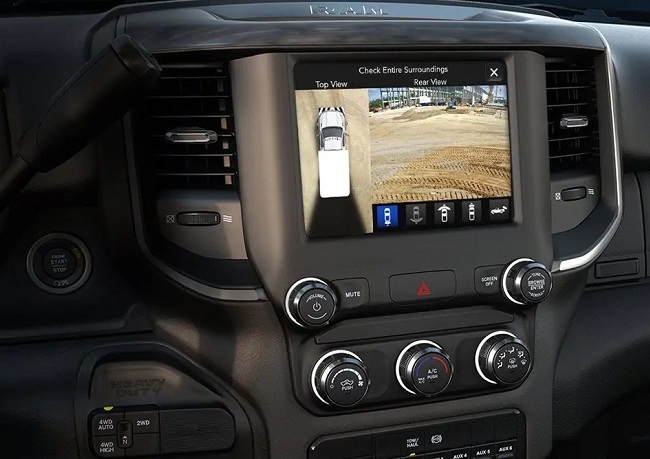 Some of the many interior features that may be in your 2019 RAM Chassis Cab include a tablet-size display screen in full color for the infotainment system, a navigation system, a quality sound system, automatic climate control with vents in the front and rear, power-adjusting front seats, speed-sensitive door locks, automatic one-down power windows, multiple USB and auxiliary ports, high-voltage power outlets, a wireless charging station, steering wheel-mounted controls with illumination, cruise control, a push-button ignition, remote keyless entry, a 270-degree surround-view camera and numerous additional features. Available features include a RAMBox cargo area, a reclining rear seat, a folding rear seat and a few other options. With how well-equipped the RAM Chassis Cab is across all trim levels for 2019, it makes sense to stop by the dealership serving Albuquerque Los Lunas Santa Fe soon to check out this truck in person. 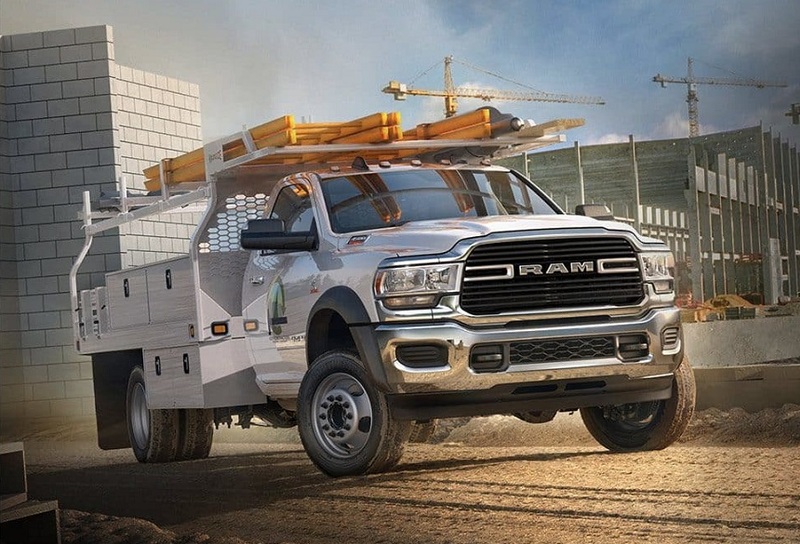 With its heavy-duty steel frame, the 2019 RAM Chassis Cab is built with the strength that you need to get through your workday easily. There are some variations in the standard and available mechanical features and capabilities, and our team in Albuquerque is ready to answer your questions about the options. You can generally expect your Chassis Cab for 2019 to be well-equipped with an advanced suspension system, anti-lock brakes, active grille shutters and other features. You can upgrade from the rear link coil suspension in some trims to the auto-leveling rear suspension. The braking system has been enhanced to ensure safety when hauling your heaviest load. In addition, the axle housing has been updated to provide you with noise and vibration reduction for a smoother ride. 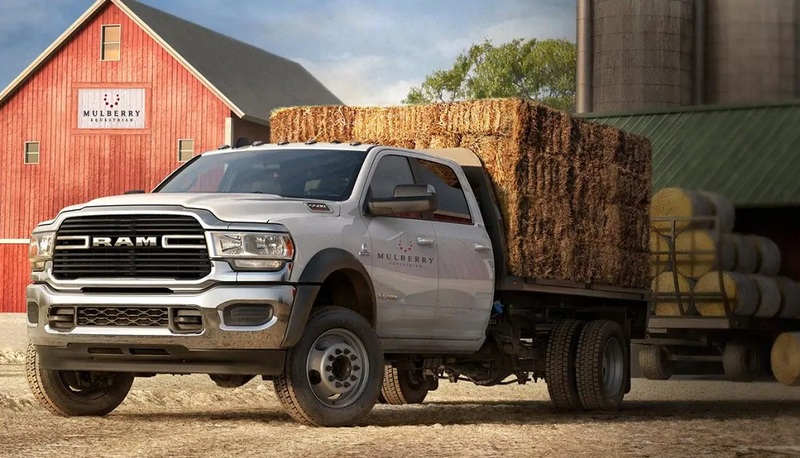 The 2019 RAM Chassis Cab in Albuquerque has a best-in-class gross combined weight of 43,000 pounds thanks to its exceptional design and powerful engine options. Notably, it also has a best-in-class rating for horsepower if you take home the 3500 model. This accomplishment is achieved through a 6.4-liter HEMI, V8 engine that gives you 410 horsepower and that comes with an 8-speed automatic transmission. If you choose the 5500 model, you can take advantage of an impressive 12,500-pound payload. An alternative powertrain is a Cummins turbo-diesel powertrain that gives you 400 horsepower and rates best-in-class with 800 pound-feet of diesel torque. This powertrain is mated with an Aisin 6-speed automatic transmission. While you can upfit the rear of the RAM Chassis Cab with your rig, you can also use this truck for towing. All models boast best-in-class maximum trailer weight. You understandably plan to put many miles on your new 2019 RAM Chassis Cab near Albuquerque, so you need a truck that is loaded with innovative and effective safety features. Some of the many standard features that are in all trims for 2019 include airbags, a full-speed forward collision warning with active braking, adaptive cruise control with stopping capability and more. You can also add optional rear back-up sensors and adaptive forward lighting to your new RAM Chassis Cab truck for 2019. 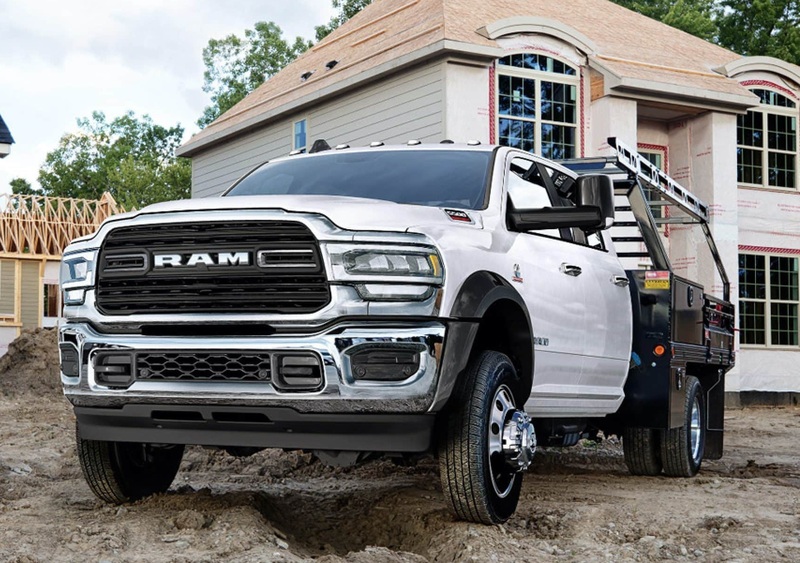 Before picking out your next work truck, stop by our dealership to check out the 2019 RAM Chassis Cab. With its many options and configuration possibilities, this may be the powerful, functional truck that you can depend on for all of your work activities.